As we’ve already said lavender pearl necklaces are very versatile pieces of jewellery that you can wear these days. With so many different styles of lavender pearl necklaces to select from deciding which is the best one for you or to give as a gift can prove quite challenging. So to help you make the right kind of decision when buying any kind of lavender pearl necklace we offer a few tips below that will help you. These are the most popular choices of metal used when a lavender pearl necklace is being made. The white gold helps to make the lavender pearls look cooler by helping to bring out their blue, green or aquamarine overtones more. This provides a much stronger contrast between the pearls and the clasp or mounting, helping to make these kinds of lavender pearl necklaces more eye-catching. 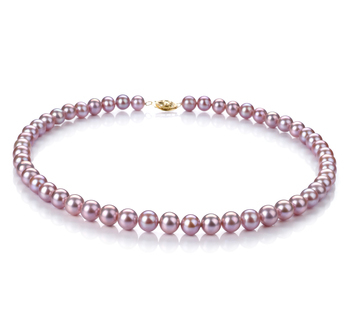 Also, you will find that this color metal helps to bring out the gold and rose overtones of the lavender pearls. 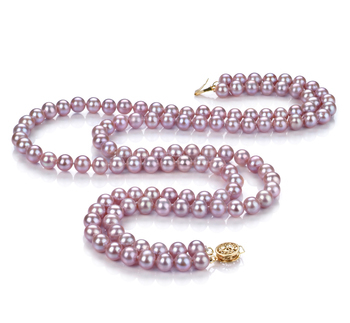 In order for you to get the most out of our lavender pearl necklace, you need to take into consideration the size of the pearls. These small size pearls will look stunning on women of all ages and will look great with a variety of different outfits. 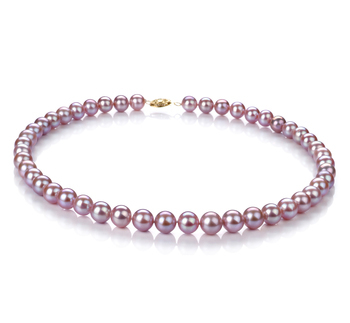 These size pearls in a lavender pearl necklace set would look especially good on younger or more petite women. Lavender pearl necklaces that are made up of pearls in this size range will look exquisite when worn to more formal events or to business meetings. They look daring, but also professional and will pull any outfit you choose to wear together in an instant. A single strand of lavender pearls is the epitome of femininity and elegance. Such lavender pearl necklaces can be worn with casual attire as well as with more formal outfits. This is why they have become a key accessory in many women’s jewellery boxes today. Lavender pearl necklaces that are made up of two strands of these beautiful looking pearls add a real touch of chic to any outfit. By including such a necklace will provide your outfit with a touch of sophistication and make you feel special when wearing them. As a once in a lifetime gift one of or lavender pearl necklaces is the perfect accessory for any woman to wear when attending a party, a business or formal event. When would be the best time to give someone such a present? This type of gift is the perfect way to help any woman celebrate her birthday, especially if it happens to be their 30th. 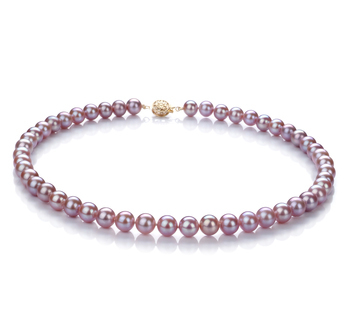 Lavender pearls are the perfect match for the more mature woman as they will help to emphasize their natural elegance even more. So why not think about presenting your wife with a strand of lavender pearls on her next birthday. This beautiful piece of jewellery will help to mark what is such a happy event in your life. It will make the wearer feel very special because the pearls in a lavender pearl necklace set are the embodiment of luxury. The color that reflects from these pearls will look stunning when she chooses to team them with a little black dress when you take her out for dinner to celebrate your wedding anniversary. This is a very thoughtful gift to present to someone you care deeply for. One of our lavender pearl necklaces with a yellow gold clasp has a timeless beauty to them. This is a piece of jewellery that the recipient will be able to wear time and time again with a variety of different outfits. Also, it is something that should they wish to they can pass on down through the generations as these are pieces that will stand the test of time. Every one of our lavender pearl necklaces is of a design that will never go out of fashion and will suit women of all ages. These are necklaces that won’t just look stunning teamed with that little black dress but help to soften the lines of business suits. They can also add a touch of playfulness to any outfit by teaming them with a matching bracelet or earrings.